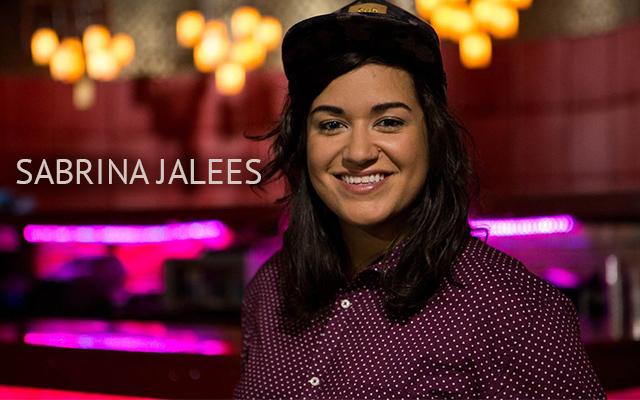 Sabrina Jalees is a Canadian comedian, dancer, actor, host, writer and your best friend. She attended the Radio and Television Arts program at Ryerson University in June 2007. She is originally from Toronto, Ontario and currently resides in Brooklyn, New York. She also writes a weekly column for the Toronto Star’s ID section and recently started writing for Canada’s Got Talent. She was really afraid that she was a lesbian when she was younger and thought it was wrong. Her mother is Swiss, her father Pakistanian and when she first came out to her mother she said, “I can’t keep this from your dad. You have to tell him.” Her father knew something was up and asked her what was wrong. At first he was shocked but wasn’t willing to lose a relationship with his daughter. He stood by her when her extended family did not. As a stand up comedian she has toured South Africa, North America, England and played the Just For Laughs Festival several times. Her very early years in comedy was captured on the Much Music’s pop culture tear-down show Video On Trial. Sabrina decided to not tell her extended family about her wedding to her now wife Shauna. Here are some excerpts from her video about her wedding and coming out to her family. Sabrina + Shauna from Leslie Satterfield on Vimeo. This entry was posted in Coming Out Stories, Equal Rights, Women Crush and tagged Comedian, Sabrina Jalees by Steph. Bookmark the permalink.